Five examples are shown in the following sections. 1. No arguments, 2. a fixed number of arguments, 3. fixed arguments with multi cell array, 4. optional arguments, and 5. an indeterminate number of arguments. A simple function xlfDate() that returns a date in date format. Line 3: Invokes the Application.Volatile method. This means the function will update (recalculate) whenever the worksheet is changed or recalculated (is volatile / changing). This may require change to Manual Workbook Calculation mode to maintain CPU performance. .
Line 4: Returns the date in General Date format (d/m/yyyy). 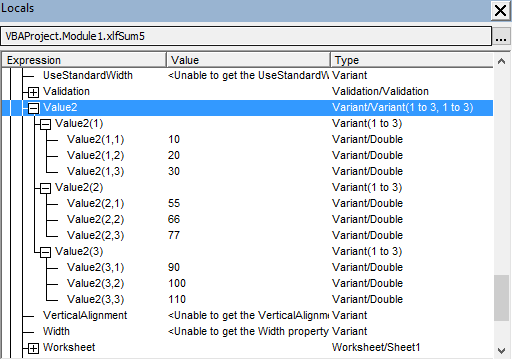 The xlfDate Function Arguments is shown in figure 1. In code 2, the xlfSum1() function (line 11 to line 14) has three compulsory arguments. 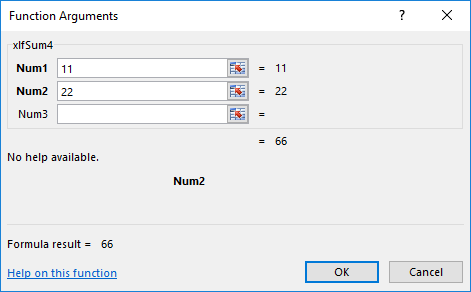 MsgBox "The sum of 2,3, and 4 equals " & Ans, Title:="xlfSum2 demo"
Line 10: Procedure declaration: a Public Function procedure named xlfSum1 with mixed case name. Three compulsory arguments - Num1, Num2, and Num3 all of type Double. Each parameter must be a number, or a reference to a single cell. 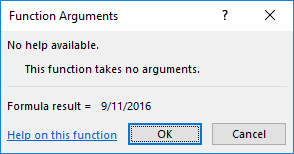 This means that there is no return value until all arguments have valid values. 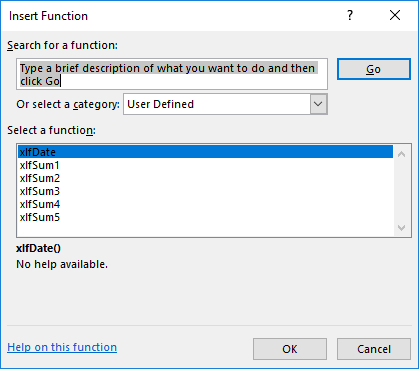 Here's how the code 2 xlfSum1() function appears in the Function Arguments dialog box (figure 2). Fig 2 Function Arguments for a UDF with compulsory arguments. All displayed in bold font. Inset: declaration line for the xlfSum1 function. 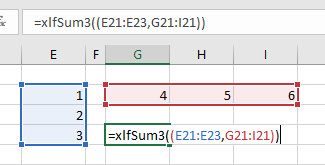 This is another version of the xlfSum function, using a (multi cell) range argument instead of a fixed number of arguments. The range is contiguous, in that, it is one block of data with rectangular shape. Arr = Arr & "55,66,77,88;"
Arr = Arr & "90,100,110,120}"
MsgBox "The sum of range with the array formula equals " & Ans, Title:="xlfSum3 demo"
The function xlfSum3() takes a Range as its only argument. The incorporation of a Range operator allows multiple ranges to be specified. In this version (xlfSum4()) there are 2 compulsory arguments and 1 optional argument. 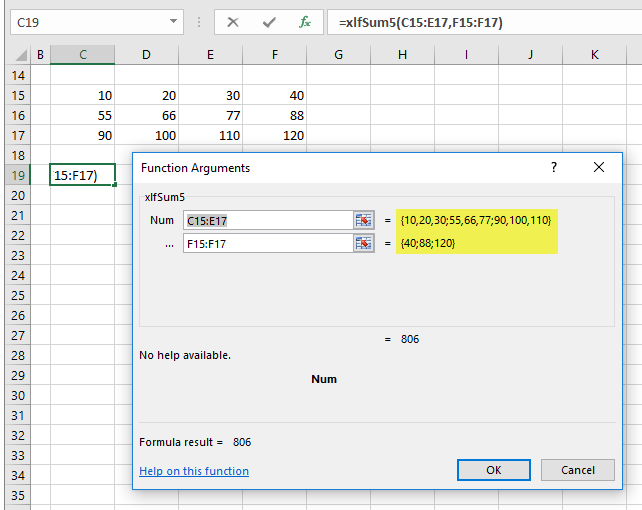 MsgBox "The sum of 11 and 22, plus the default value 33 equals " & Ans, Title:="xlfSum4 demo"
MsgBox "The sum of 10, 20 and 3 equals " & Ans, Title:="xlfSum4 demo"
Figure 4.1 illustrates the Function Arguments for the test procedure in code 4. A ParamArray is an array of parameters. 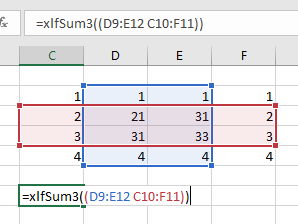 MsgBox "The sum of range with the ParamArray argument equals " & Ans, Title:="xlfSum5 demo"
This example was developed in Excel 2013 and updated in Excel 2016.